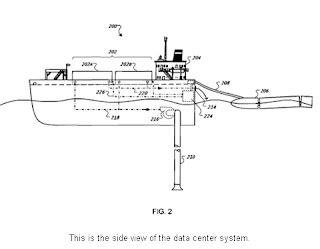 Google is pondering a floating data center that could be powered and cooled by the ocean. These offshore data centers could sit 3 to 7 miles offshore and reside in about 50 to 70 meters of water. The search giant filed for a patent in February that was approved Aug. 28. The patent outlines a concept that would not only be savvy engineering, but deliver great returns. Rich Miller at Data Center Knowledge called Google’s patent a “startling new take on data center engineering.” I’d call it brilliant engineering, but the financial engineering could be even more impressive. Google could power these data center pontoons with wind potentially and cool them with water. You could argue that these ocean data centers could be self sustaining. Property taxes? There’s no property. State negotiations and building rights? Launching these data centers may require a lot less red tape.